New Arab Media (NA3AM) has unveiled a new and improved version (1.1) of Nitro Punch, its flagship demolition derby title which pits heavily armored battle-ready cars against each other in the ultimate contest of vehicular combat. Available to download for free on the App Store since Friday, May 15, Nitro Punch enables players to choose one of several vehicles and engage in battle with opposing drivers. All while racing through a stark desert landscape where the rules are simple: the last driver to survive wins. 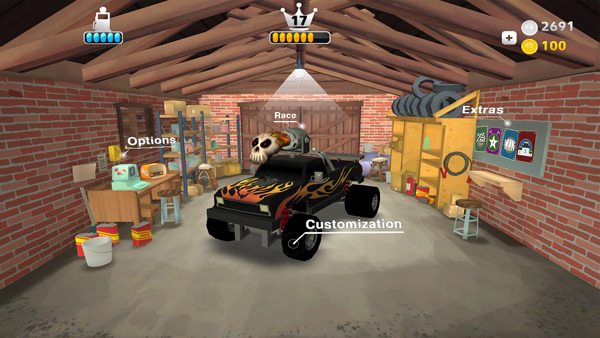 Featuring a powerful state-of-the-art 3D engine which combines 2 different game modes (drag race and a demolition arena), players can pick their favorite cars, upgrade them and challenge worthy opponents with a variety of devastating weapons such as the punch launcher or explosive barrels. Commenting on the game, Eske Knudsen, NA3AM’s lead game designer says “with Nitro Punch we really set out to create the most entertaining game possible where players could cause maximum annihilation in the most creative ways possible – all while giving players a user friendly interface”. This latest version of Nitro Punch improves upon previous ones by offering an improved user interface while in addition unlocking a number of new trophies so players can get a richer experience when competing with their friends through Facebook. Players also have a lot to look forward to with the next update of the game, which will feature a new car, army themed customisation and an all new battle arena set on an aircraft carrier in the middle of the ocean. New Arab Media (NA3AM) is an award-winning gaming and trans-media incubator. Across its three divisions, NA3AM Games, NA3AM Enterprises and Yallah Ta3leem, it creates, promotes, licenses and develops creative content and products from entertaining games through to animated series, web comics and educational software. NA3AM Games produces games about and for the benefit of the Arab world, filling a void for underservices audiences in gaming and media. From racing and adventure to competitive sporting games, NA3AM’s games address cultural Middle Eastern themes while at the same time retaining appeal for the global market. Based in Amman, Jordan and Copenhagen, Denmark, the company was founded by His Highness Prince Fahad Al Saud and has a 25 strong team of leading international programmers and video game artists which hail from a diverse range of backgrounds. NA3AM recently won the demo showcase at the Slush 2014 conference which was held earlier in the year in Helsinki.